Why is NGC 6240 tangled? Not all galaxies are neatly shaped. As Hubble revisited galaxy NGC 6240, the knot region was revealed more clearer than the images taken in 2008. It appears NGC 6240 is on a collision course with another galaxy. The gravitational pull between the two galaxies is too great at this point for one to escape the other. The collision resulted in a tangle between the stars, resulting in a new twisted shape of the galaxy. The merging also resulted in some stars exploding into supernovas. The latest supernova explosion in the galaxy was recorded in 2013. The centers, believed to contain black holes, are expected to collide as well. At this point they are only 3000 light-years apart. Very close, considering that the galaxy itself is 300,000 light-years across. Right now they are spiraling around each other closer and closer. NGC 6240 lies 400 million light-years away in the constellation of Ophiuchus (The Serpent Holder). 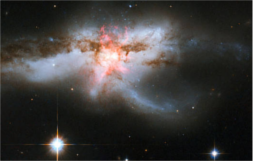 This galaxy has an elongated shape with branching wisps, loops and tails. This mess of gas, dust and stars bears more than a passing resemblance to a butterfly and a lobster.